Creation: Appeared as dotted lines around 1988, although mentioned by name in CTB Minutes back to December 1967. Ran from I-95 to VA 76 only. This is the 2nd VA 288. Adjustments: The first piece to be shown as open was between US 360 and VA 76, in 1989. 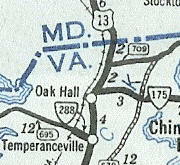 The 1990 Official Map shows VA 288 also open between US 1-301 and I-95. The three scans below illustrate the progress from 1989-91 (click to see larger view). The piece between West Creek Pkwy near VA 6 to US 250 opened as a super 2 about late 1997. On 12/22/03, VA 288 was opened from US 250 to I-64. 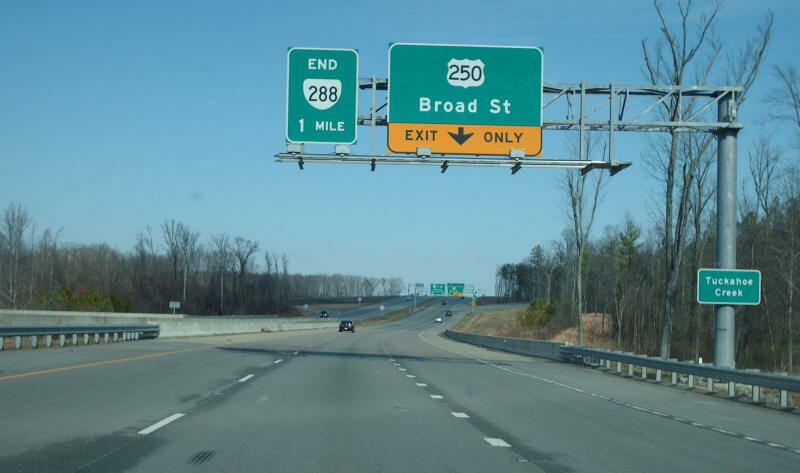 In spring 2004, VA 288 was opened between VA 6 and US 250 as the full freeway. 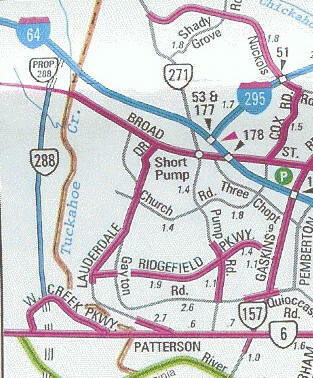 On August 27, 2004 VA 288 was extended south from VA 6 to US 60. The final segment of VA 288 between Lucks Lane and US 60 opened Nov. 19, 2004. Improvements: Paved upon inception; 4-lane freeway in all sections, except I-64 to US 250 is 6-laned. Legislative names: World War II Veterans Memorial Highway, designated 3/16/03 (entire route). The bridge over the James River is also separately named legislatively the same name. 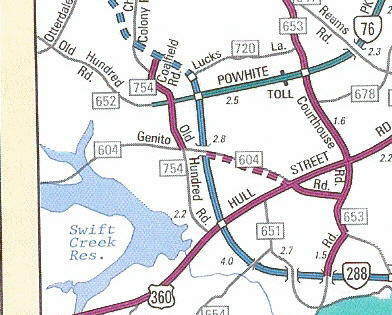 Comment: Now completed, VA 288 provides a western bypass of Richmond and allows access to US 60 and US 360 from either direction of I-95 without using the tolled Powhite Pkwy. 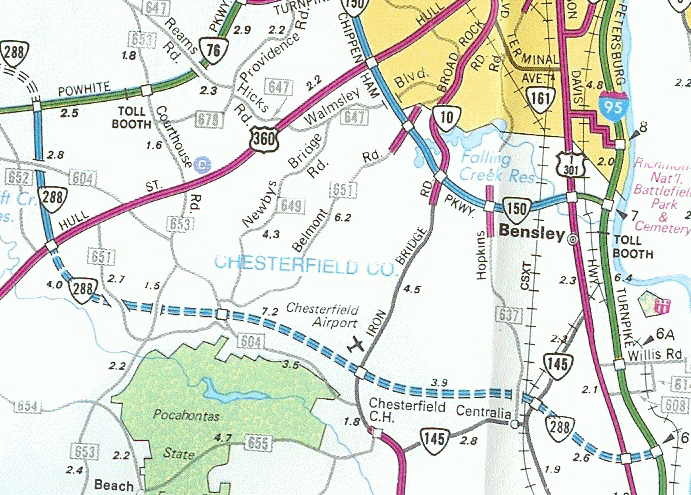 Virginia requested VA 288 become an interstate in 1968 to form the western half of a Richmond Beltway and I-295 would meet it where it connects to I-95. 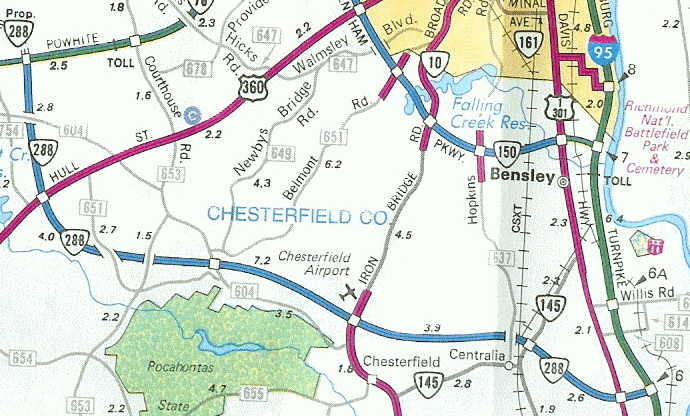 Interstate status was denied and in 1977, the City of Richmond petitioned the CTB to drop the idea of a western interstate connection entirely. See Scott Kozel's site for a more detailed look into VA 288's history. VA 288 #1: Appeared August 1933 (CTB Minutes) as new routing. Was a spur west off US 13 Temperanceville. Ran only as far as the railroad tracks. 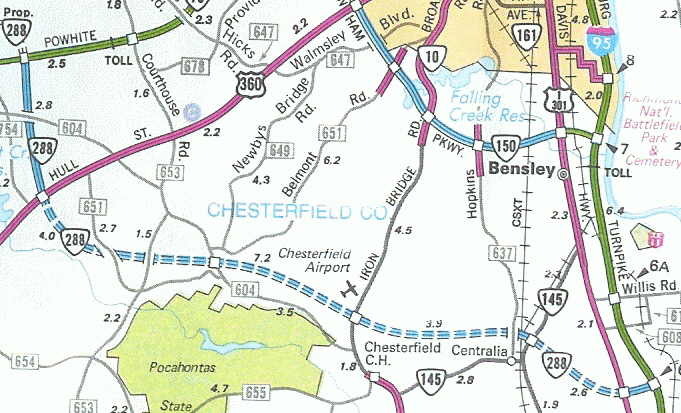 VA 288 was downgraded to SR 695 in June 1947 (CTB Minutes).